Bangkok is a foodie's heaven and my private Khlong Lat Mayom Floating Market tour will show you why. All sorts of local Thai food can be found at this local floating market. We'll also take a long-tail boat trip along the canal and see how the locals live their life. Meet up at Bang Wa BTS Station. Please note that there are additional cost for pickup at other locations. Arrive at Khlong Lat Mayom Floating Market. Take a long-tail boat trip along the canal. The trip lasts about 90 minutes and there are a lot to see along the way. There are interesting stops like a local temple and an orchid farm. 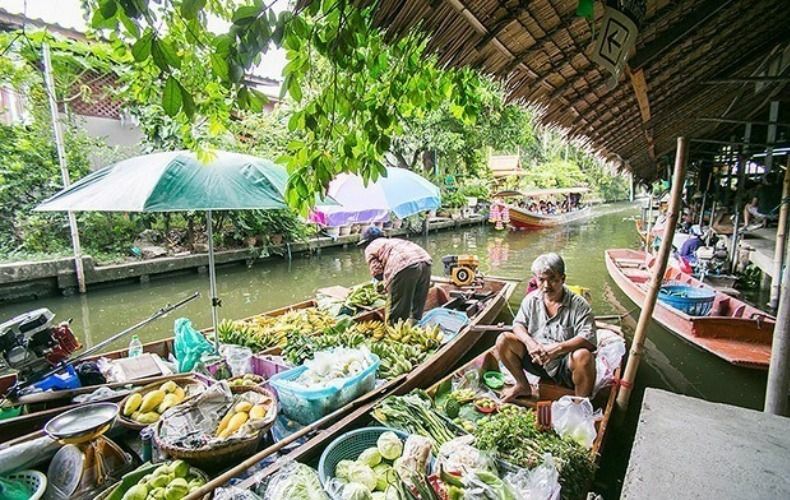 Try different local food and snacks and buy some souvenirs at Khlong Lat Mayom Floating Market. Drop you off at the BTS station. End of our private Khlong Lat Mayom Floating Market tour. A 'must go' weekend floating market. Love the fact that this floating market is not commercialized, and less touristy. There are so many Thai food/snacks with reasonable prices you can try over there. You can hardly see foreign travelers there. That means you can enjoy the real local vibe. And, since you are with me, there is no possibility of you getting ripped off like other famous/ touristy floating markets. Khlong Lad Mayom is one of the most authentic/ oldest floating markets in town; the place with its charming sight and the people with their local liveliness and kindness. You will love it! Best bit is the market and floating market. Long tail boat tour was okay. Difficulty getting on and off the boat. Whole tour not value for money. Had a great market tour. Informative and fun with lots of great food. We had a lovely tour exploring the market with our guide. This is such a different side to Bangkok and the tourist areas and skyscrapers. This tour lets you see how the locals spend the weekend and you will get to taste amazing food. Highly recommended.